Mary Reineberg Burchard was a test pilot with the Women AirForce Service Pilots (WASP) of WWII, a Congressional Gold Medal recipient. a proud veteran, doctor, and beloved mother and friend. Even within weeks of her passing, whenever Mary heard a plane she’d scan the sky, shake her fist and say, “You lucky stiff!” The lure of flying never left her. 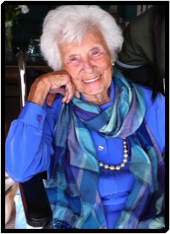 The call to take her last flight came on January 28, 2012 surrounded by her faithful crew of children and loving caregivers at Aegis Living of Laguna Niguel California. She was 95. Mary was born in 1916 in York, Pennsylvania. She was the oldest child of a well-known York shoe store family, Jacob and Salome Reineberg. Inspired by Amelia Earhart’s flying feats, 12 year old Mary Reineberg stood up in her class at St. Mary’s Elementary School and announced, “I’m going to be an aviatrix!” Mary always laughed at how audacious it must have sounded for this little girl to have such grand ambitions. Upon graduation from high school, Mary was among the first women to study at Temple University’s School of Surgical Podiatry in Philadelphia. She graduated at 21 as a surgeon-podiatrist, being given the highest honor ever awarded a woman in clinical proficiency. Mary returned to York to open her practice. While she worked hard as a young doctor, the dream of flying never went away. It took 11 years from her grade school pronouncement to do it. During the early part of World War II, Mary got her pilot’s license through the national defense program where she and 9 male pilots made up the Civil Air Patrol – York Squadron 301. As the war raged on, Mary wanted to do more and knew her flying skills were needed. Out of 25,000 applicants, Mary was one of 1,830 accepted into the visionary and grueling Women AirForce Service Pilots training. With the WASP she learned to fly the “military way” at Avenger Field in Sweetwater Texas. Only 1,074 women earned their wings and Mary Reineberg was one of them. Based in Marana, Arizona, Mary was a test pilot on the AT-6, an advanced trainer plane that was the essential part of training men for combat. Above the Arizona desert she put these planes through hammerhead stalls, barrel rolls, loops and other gut-wrenching maneuvers to diagnose problems, make sure bolts and oil lines stayed on, and landing gears locked in place. Mary loved every minute of it. Her WASP dream came to an end with the sudden order to deactivate all the women military pilots to make jobs for the men who were not needed in great numbers in combat. Though shattered by this, Mary looked for how else she could help her country and joined the American Red Cross. Mary was sent to Naples and southern Italy where she spent 18 months as director of social activities for American troops waiting to go home. This was a perfect fit for Mary who was gregarious, enterprising, fun-loving and a natural organizer. She loved Italy, loved the work, and proud she could help until the war ended. On the troop ship coming home Mary met her future husband, Jack McDargh. They married, moved to Denver Colorado and had three children, twins Dr. John McDargh and Eileen McDargh Elvins, and Susan Mullins. Over the years, the family moved several times, with Fort Lauderdale, Florida being the place Mary called home for 40 years. Though those bigger-than-life adventures gave way to joys and difficulties of family life, her children say Mary taught them all those lessons and values which defined her early years. “Our mom gave us her love of adventure and travel. If she couldn’t join us, she was our pocket companion wherever we went in the world. She modeled for us courage and calm in the face of hurricanes, accidents, and illness. Her resiliency and fierce independence sustained her through life’s changing times. Mom passed along a deep belief in service to our country, to God, community and family. She delighted in the beauty of a flower, a sunset, a poem, a joke, and a good meal. Mom gave hugs with real meaning. She believed in us even when we weren’t able to. With everyone she’d want to know, “So, what are you up to?” and she really wanted to know. Mom took every opportunity until her last breath to let us know she loved us. Mary was given many nicknames by those who loved her—Doc, Mamacita, Mama, Mamoo, Mambo, Nana, Mrs. G, The Duchess, and simply “Mom”. She loved that. Mary is survived by her sister, Sr. Clare Reineberg ASC (Columbia, PA), her children Dr. John McDargh (Boston), Eileen McDargh Elvins (Dana Point, CA), Susan Mullins (Los Angeles), loving son-in-laws, 5 grandchildren and 4 great-grandchildren. v/r posted -- written by Mary's daughter, Susan Mullins. What an amazing woman and an astounding aviatrix! All the WASP seemed to have that same wonderful spirit of adventure, courage, love of country and sense of humor! We wish we had gotten a chance to know her. Vi Cowden, her sister WASP, brought so much joy to our lives - we can only imagine that Mrs. G did the same for so many people!